Many thanks to Amy who was a commenter on the post about the Hank Williams ‘Last Ride’ movie being filmed in Benton Arkansas. 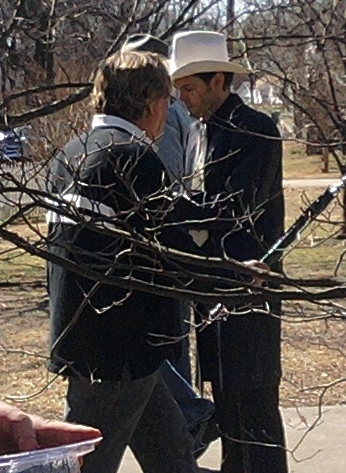 Amy has sent me some photos of the film shoot with some great pictures of the star Henry Thomas dressed as Hank Williams. Finally Jesse James who plays Charles Carr and the Caddy. Thanks so much Amy. I’m sure people really appreciate being able to see these pictures and get a preview of what the movie will look like. I can’t believe I actually managed to get these imported. I’m a computer klutz, and this is a first!! 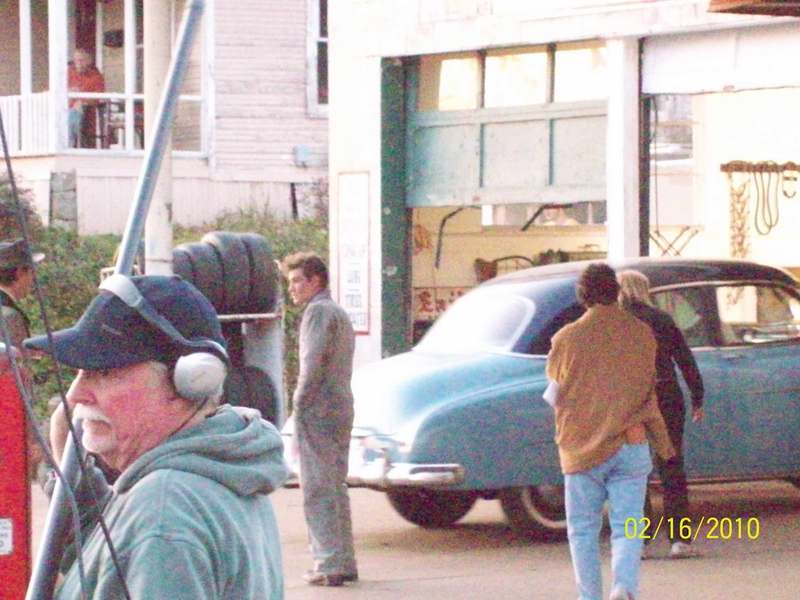 The news is out that filming of a biographic movie of Hank Williams’ final days is underway in Benton Arkansas. The movie is directed by well-known TV and film director Harry Thomason. His wife Linda Bloodworth- Thomason is also a prominent figure in Hollywood.Their credits include Designing Women and Evening Shade on TV. The movie is tentatively called ‘The Last Ride’. You may recall that I wrote about this project earlier and a commenter on that post explained to us that shots of a vintage 1951 Cadillac were being taken in the Oak Hill West Virginia area. 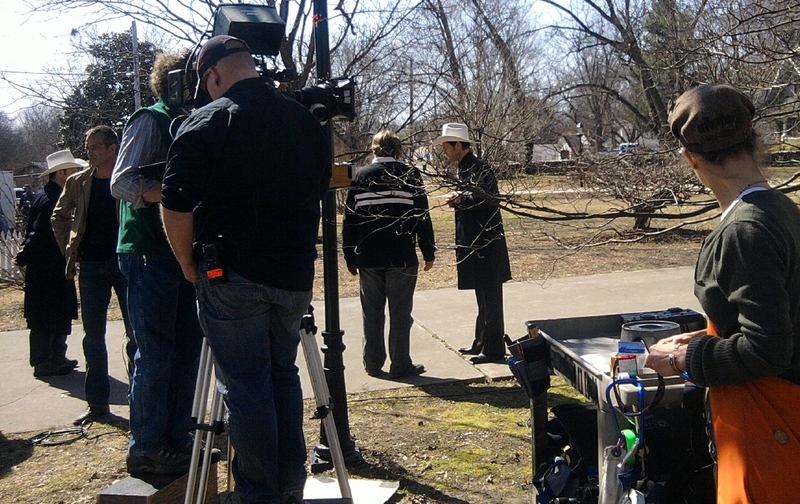 Thomason was involved in the West Virginia shoots although there are different producers mentioned for the two projects. Jeff Queen from Alabama was the first producer, but this film is being co produced by Tim Jackson and Josh Miller of Category One Entertainment in central Arkansas. They are both Arkansas natives as is Thomason. The movie is being produced under a new Arkansas film production incentive program. I have also written on plans for a full scale Hollywood style biography of Hank Williams, but I haven’t seen any recent news on that one. You would have to expect that there couldn’t possibly be three new films on Hank’s life. The production company has transformed downtown Benton, changing store fronts, and signs and bringing in a fleet of local vintage automobiles. The Benton Courier newspaper has a good write-up and picture here. Henry Thomas played Eliot in ET many years ago, Here’s a picture of him as he looks now beside a picture of Hank. Here are links to my previous posts. The major motion picture announcement. Here’s the link to the earlier ‘Last Ride’ post based on the announcement of a film by an Alabama company. This post also contains a lengthy comments section with a video from Jake Penrod, and a post and link to the Harriman Tennessee Princess Theatre project which was involved in the vintage auto filming which took place around Oak Hill West Virginia. The shattering rendition of Hank Williams’ ‘Alone and Forsaken’ on the Haiti benefit broadcast smashes open a door many have looked through for a long time. Her love like the leaves now has [Em] withered and [Am] gone. And out in the darkness the [Em] whippoorwills [Am] cry. Oh, [Em] please under-[Am] stand. Each vow was a plaything that she threw away. Forsaken, forgotten – without any love. Nothing in the program with all the superstars, the poets, the singers, the writers, nothing more honestly and graphically caught the utter destruction for both nature and man of an earthquake, hurricane or any other horrible explosion out of the sky or earth. Of course at one superficial level this is a song of love gone wrong. But what writer would unleash such language to deal only with the up and downs of human relationships? Notice how incidental, how unimportant the love story is to the main message being driven forward by the power of the imagery piling up line by line. And notice how the first line of the refrain so purposefully brings to mind picture of Christ on the cross and his final words. The door which opens to all who hear Hank Williams both the voice and the expression as well as the words and mournful melodies, is the realization that these mean more than what they say, they are metaphorical. They tell us as much about Hank Williams gazing into the mysterious abysses and joys of human life on earth as they do into breakups, divorces, marital warfare and reconciliation. For Hank Williams, who wrote many purely philosophical or religious works such as ‘I Saw The Light’ and recorded many standard southern hymns, ‘Alone and Forsaken’ shows that for him as a writer the male female relationship, while often a central subject, could also exist as something of a coat hanger on which it was possible to hang a more elaborate wardrobe. ‘Hope for Haiti Now’ brought it all back in a few moments, fortunately witnessed by probably 100 million people.